RAPAPORT... Alrosa’s sales dropped in the second quarter as the closure of the Mir underground mine resulted in a lower supply of rough diamonds. Revenue from rough stones declined 7% to $1.06 billion for the three months ending June 30, the Russian miner said Monday. By volume, sales fell 12% to 9 million carats as the average price of gem-quality diamonds grew 18% to $164 per carat, reflecting a shift to higher-value goods. Sales of gem-quality rough slid 22% to 6.3 million carats. Alrosa’s production fell 18% year on year to 8.5 million carats during the quarter, after a fatal flood at the Mir mine in August 2017 forced the company to suspend the operation. The processing of lower-grade ore from the Jubilee pipe and Aikhal assets, as well as the recovery of lower diamond grades from Alrosa’s International mine, also impacted output. 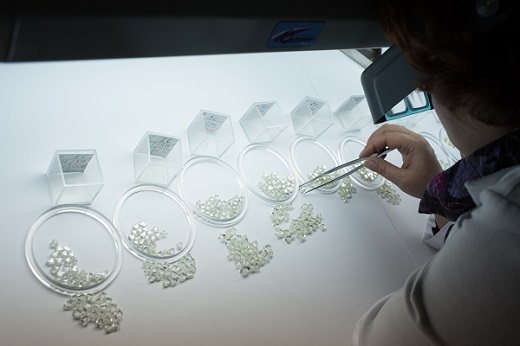 Alrosa has used some of its inventory over the past year to offset the lower production. As a result, stock levels have fallen 23% to 11 million carats as of June 30 compared with a year earlier. Alrosa maintained its forecast of an 8% decline in production to 36.6 million carats this year, compared with 39.6 million carats last year. The company’s polished-diamond sales climbed 15% to $26.2 million in the second quarter.